If the umpteen repeats of Raiders of the Lost Ark on the TV or the mega popularity of video games like Tomb Raider prove anything, it’s that we love a bit of adventure in our lives. Slots manufacturers certainly know this, hence the veritable cavalcade of Egyptian/Adventure/Action/Roman /etc themed slots we get clogging up the market. Slot developer Betsoft Gaming are back in whip-cracking mode with their Treasure Room slot, a 5-reel, 20-payline video slot full of color and excitement. From the outset you know you’re in firm Indiana Jones territory. The backdrop is a torch-lit tunnel with walls adorned with hieroglyphics. Flaming torches burn on the walls as you play. On the reels you’ll find treasure chests, diamonds, gold coins, Roman helmets, sapphire rings and glass vials, plus a treasure map (very handy) and an egg timer. 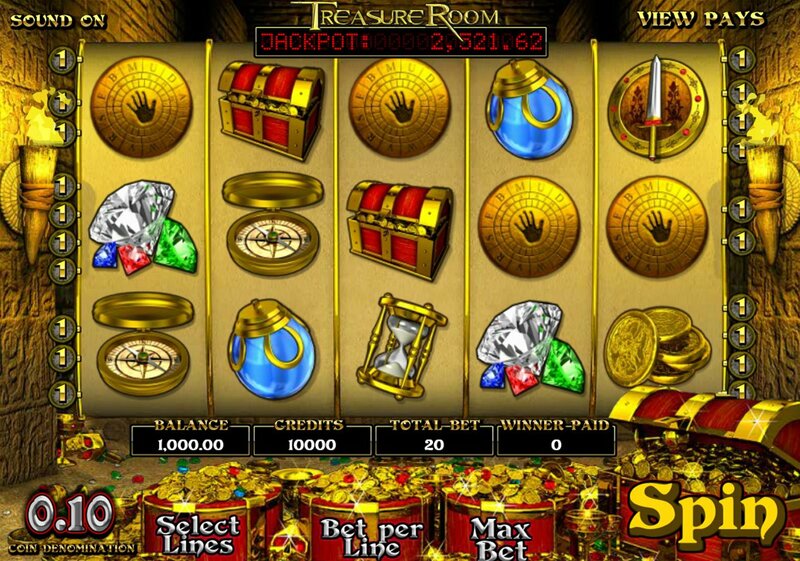 Five treasure chests pays out the maximum jackpot of 1,000x your line bet. The Compass Has Gone Wild! The Wild is the compass and it substitutes for all symbols other than the Bonus Scatters and Jackpot icons. This can help to complete some big winning combinations. Three or more Scattered Bonus Feature icons (it’s the puzzle wheel with a hand print in the middle) triggers the Treasure Room feature, a second-screen bonus where you are presented with three doors. Select any of the doors to reveal treasure hidden inside. Keep on choosing until you have collected three precious stones. Three or more sword and shield icons, meanwhile, activates an on-screen Click Me Instant Win bonus. Choose one of the icons to reveal wins ranging from 125-5,000 credits. Don't Forget the Progressive Jackpot! 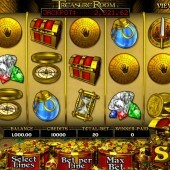 Finally, five treasure chest icons on the reels hit at the maximum bet will bag you a lovely progressive jackpot. There’s definitely a lot to recommend in Treasure Room, but there are certainly plenty of alternatives in a friendly online casino near you. In terms of medieval madness, check out two slots from Microgaming: the mythical-themed King Cashalot and the Arthurian-fuelled online slot, King Arthur.